Sorry I've been a bit absent over the last few weeks. I've been traveling non-stop for work. Things will start to slow down a little more as we get in to June, thankfully! I'd begun to grow weary of my living room...don't get me wrong I still love teal and colors, but the older I get I'm more into a neutral living space in the main areas. It's just more calming and soothing. I loved the neutral look of our bedroom, but never got around to doing that sort of palette anywhere else in our house. 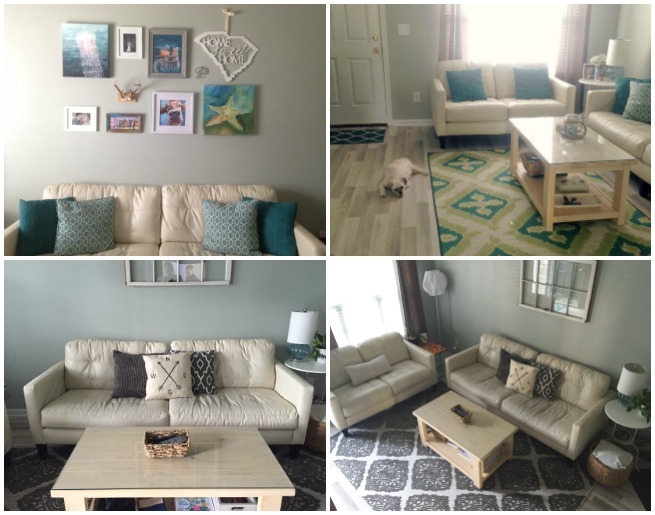 Over the weekend, M and I worked to neutralize the color palette in our living room. We purchased 2 things, a new rug (we needed one anyway...our old one was too small and stained) and an old window to hang over the sofa. Here's what we were working with before (top row) and after (bottom row). One of the things we loved about this house when we bought it was the flooring. It's this really cool gray-toned wood and it inspired the palette for the living room. Well, that and apparently the dog too. I knew I wanted something old yet simple to put over the couch and I had my mind set on an old window. We went to a local antique store over the weekend and found this one for $18. I love it! It's still a little small on the gigantic wall behind the sofa, so we will continue to look for something to flank the sides. I like the idea of smaller funky window or stained glass windows..or even some sconces. I'm in no hurry to fill the wall up since we had a pretty full wall before. All of my art work from the gallery wall has been repurposed throughout the house. I actually look at them more now than I did when they were on the wall over the couch. I love changing the scenery in my own house. Pillows and rugs are two very easy ways to do it! Looks great!